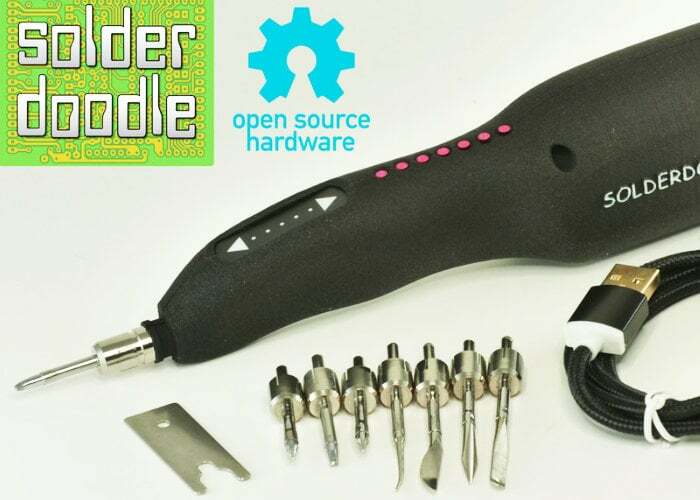 Makers hobbyists and electronic enthusiasts searching for a cordless USB soldering iron may be interested in the Solderdoodle Plus once again launched via Kickstarter, this time securing as required funding to make the jump from concept into production. Watch the demonstration video below to learn more about the Solderdoodle Plus cordless soldering iron and hot tool which is available to back with early bird pledges available from $99 or roughly £78. The Solderdoodle Plus It is capable of providing 60 minutes at 500 Degrees Celsius on a single charge and once flats can be easily recharged using any available USB port. Each kit comes complete with a seven piece tip set offering : Conical, Chisel, Wood Burning, Needle, Blade, Spade, and Scooper Tips with Removal Tool. For more details follow the link below.